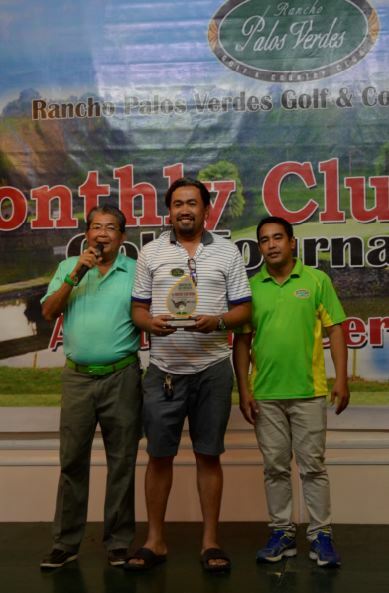 Davao City – Philippine Airlines Interclub campaigners Jerico Bajo and Jing Tan made their presence felt by leading the cast of winners at the close of the seventh edition of the Rancho Palos Verdes Golf and Country Club Monthly Medal tournament held over the weekend. Bajo carded a remarkable four-under 68 to cap the overall gross title which added another trophy to his cabinet of monthly medal championships while Tan finished with 63 to bring home the overall net crown. RPVGCC MONTHLY MEDAL WINNERS. Winners of the 7th RPVGCC Monthly Medal winners pose for posterity after the awarding ceremonies. Perennial monthly medal winner EJ Casintahan settled for the Class A gross title with a one-under 71 followed by Addy Briones who had 75, good enough for the gross runner-up. JP Marfori, stood at the winner’s podium for the Class A net crown with 68 while Kim Il Gyu had 75 for the runner-up honors. Class B division winners saw King Rivas 77 (gross champion), Eugene Chiong 79 (gross r-up), Oscar Rebosura 65 (net champion) and Eman Sanchez 68 (net r-up). 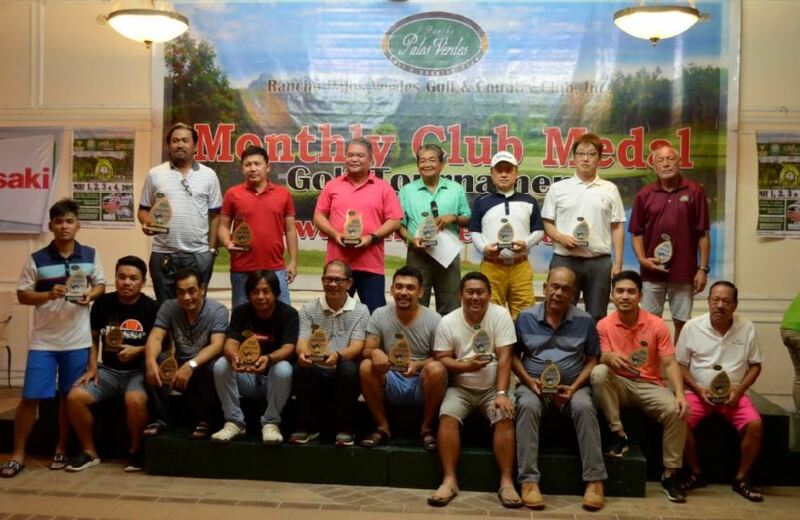 For Class C they are Gil Bullecer 85 (gross champion), Edwin Ledesma 87 (gross r-up), Ronnie Magsico 66 (net champion), Fred Penarroyo 68 (net r-up) while Bob Lacaya 93 (gross champion), Kim Kwang Keum 93 (gross r-up), Michael Lim 69 (net champion) and Cris Babol 79 (net r-up) complete the Class D category winners. OVERALL GROSS CHAMP. Jerico Bajo (center) receives his overall gross trophy during the awarding rites. With him is Board of Director Ting Castillo and RPVGCC staff Wilson Obongen. Sharing the honors are Philip Hazlewood 76 (Seniors division gross champion), Joe Marfori 81 (Seniors division gross r-up), Boy Tan 66 (Seniors division net champion), Vic Gonzales 70 (Seniors division net r-up) and John Siguenza 102 (Super Seniors division gross champion). Completing the honor roll are Guest Division 1 – Oying Caturan 77 (gross champion) Apo Luna 82 (gross r-up), Neil Ruelan 69 (net champion), Pitt Batu 70 (net r-up); Guest Division 2 – Rommel Lee 81 (gross champion), Ferdinand Rondina 83 (gross r-up), Nono Bata 62 (net champion) and Vincent Valencia 64 (net r-up); Jungolf – Jessie Tan Jr. 91 (12-17 years-old division champion). Special trophies were given to the winners during the awarding rites by RPVGCC general manager Tommy Inigo and board of director Ting Castillo.